Slowing things down a little today coverage wise for another SEMA Showstopper. Erik actually spotted this car on opening day (while I was off getting married) and suggested that I take a peak inside the car once I was done looking under the hood. When I did finally track this Benz down I took his advice and was treated to one of the most thorough ‘cross-breed’ cars I have seen in awhile. Check back tomorrow for some Classic American muscle from the 2012 SEMA show. 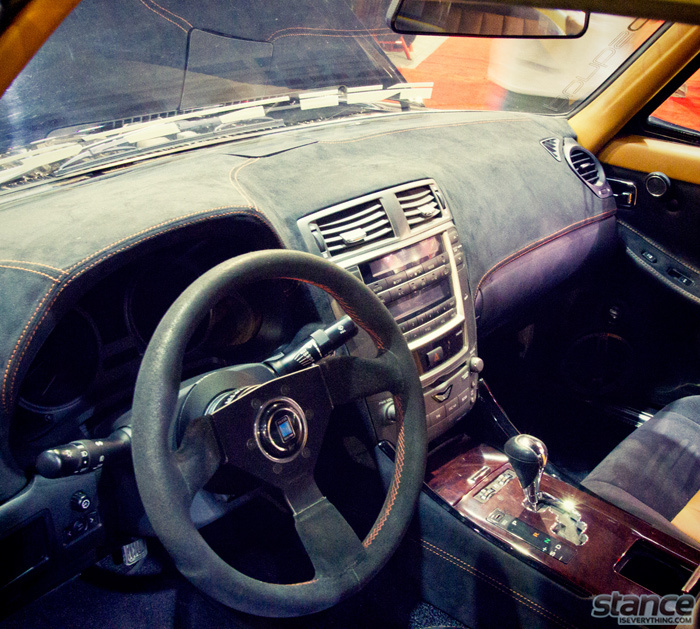 Next articleEvent Coverage: Sema 2012 – Part 4.
congrats on getting married dave! cool build, is there anything benz left in it, apart from the body? I assume the suspension is most Benz but I’m not 100% sure. Not much left though. Not feeling it besides the fact that it’s a coupe. The look doesn’t fit the car. um, how do you open the doors from the inside? it looks like the dash blocks the inner door handles. That is a good question. I suppose you have to wind down the window then open it. Good question on the door opening. One thing I’ve noticed over the years, when you really start to look at the details of most show cars, there’s no way most of them can run well as a driver. Little things are missing – either due to time or achieving “the look” they were after. Do you think the door opens by the small chrome lever/switch/thingy you can see south of the mirror in the fourth image? Oh, and amazing find on a model/spokesperson that actually knows something about the car they’re standing in front of. It’s not just the “eye-candy” that are 31 flavours of useless when you ask a simple question. Most of the salespeople fall into that category too. There is certainly a lot of details on some show cars that fall right on their face under further inspection but if they left out the door opening I would be really surprised. I suspect you are right Donn with that lever opening the door. That is my hope anyway. And yes not sure if Nitto trained the model or she just knew but it was really refreshing. And thanks for the best wishes on the marriage!